Please listen on headphones if you can. First Broadcast on Monday 9th October at 18.00 on RTE Radio 1 Extra. Dave Lordan performs his poem ‘Love commands the neighbourhood’ dedicated to his friend Karl Parkinson. 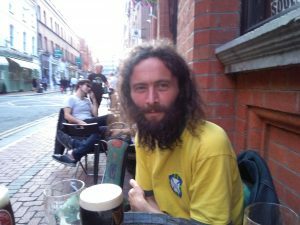 The poem evokes the alienating and non linguistic neighbourhood noises that he experienced, living in housing estate in Co. Wicklow and the attempt to cleanse his hatred and aggression towards the area. He speaks about wining a poetry competition at the age of 12, his various books and how he feels he has expressed all he can in poetry. 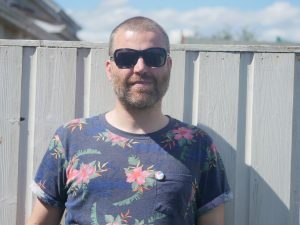 Dave Lordan is a multi-genre writer, performer, editor, and pathbreaking multimedia educator with 4 acclaimed books & 20 years experience in creativity education & cultural programme design. He is especially interested in transgenre collaboration with other artists, & in partnering with educational, cultural and media institutions to design, develop & deliver workshops, courses & programs in fields such as creative writing, contemporary literature, hybrid/multimedia literature, performance literature, creative literacy, Irish literature/culture, experimental literature, & teacher-training. Dave has a record of success in course/workshop design & delivery at primary, secondary, undergrad, postgrad, early school leaver, gifted children, visiting university students & tour groups. Recent artistic collaborations include with Christy Moore, radio artist Bernard Clarke, alt.film maker Eamonn Crudden, & Karl Parkinson. First Broadcast on Monday 15th October at 18.00 on RTE Radio 1 Extra. 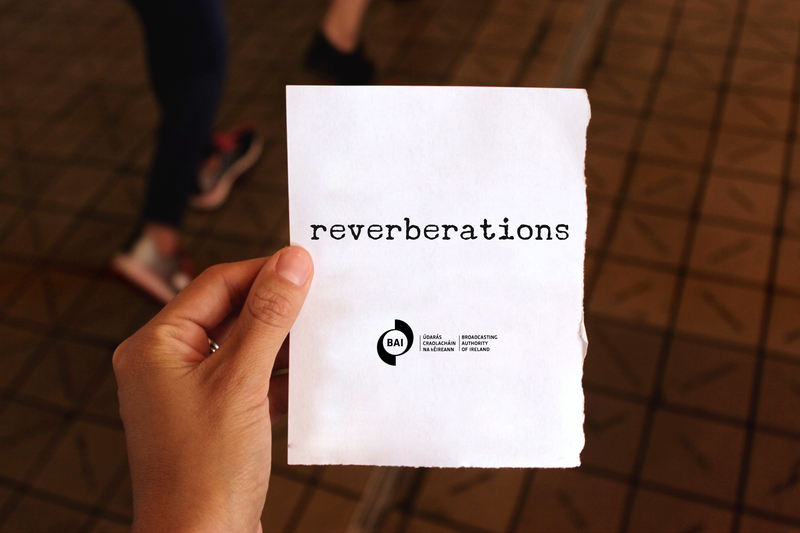 Órfhlaith performs the poem ‘In A Dead Town Where I Once Lived’; composed for the Reverberations series. It is set in the poet’s grandmother’s sweet shop and at her grandfather’s farm where Órfhlaith spent some years of her childhood. 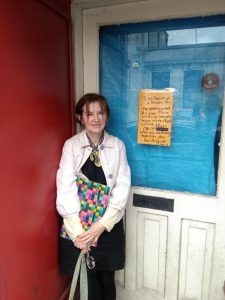 The poem explores sounds and memories that are still alive for Órfhlaith although her Grandparents’ are now dead, the shop is defunct and the farm has been parcelled up over the years and most of its acres sold off. 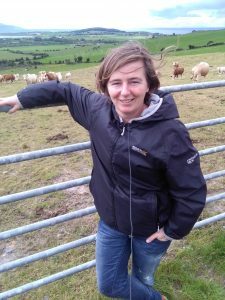 The poem was recorded on location in and around Athlone town in Co. Westmeath and in the last field of her grandfather’s farm in Ballykeeran. Órfhlaith discusses how the relationship with her grandparents, their lives and their work informed her own love for the imagination and story and what writing means to her; how necessary it is to her life, and how art is necessary no matter what. Órfhlaith Foyle’s first novel Belios was published by The Lilliput Press. Her first full poetry collection Red Riding Hood’s Dilemma Arlen House) was short-listed for the Rupert and Eithne Strong Award in 2011. Arlen House published Foyle’s debut short fiction, Somewhere in Minnesota, in 2011 and its title story first appeared in Faber and Faber’s New Irish Short Stories (2011), edited by Joseph O’Connor. Foyle’s second short fiction collection Clemency Browne Dreams of Gin (Arlen House 2014) was chosen as one the Irish Times books of the year. 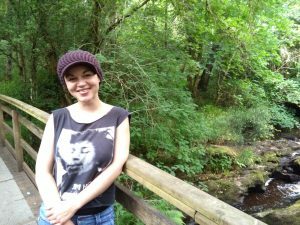 Her work has been published in The Dublin Review, The Wales Arts Review, The Manchester Review, and The Stinging Fly. Órfhlaith Foyle was born in Africa to Irish parents and now lives in Galway, Ireland. First Broadcast on Monday 23rd October at 18.00 on RTE Radio 1 Extra. Paul performs his poem ‘River’, which takes in the different aspects of the River Lee in Cork City. From the tranquil sounds upriver to the intermingling of nature and human soundscapes and onto the heart of the city. He discusses how a long bus journey started him on his journey as a poet, his sense of curiosity and his work with Ó Bhéal. Paul Casey’s poetry has been performed and published in many countries worldwide. His most recent collection, Virtual Tides, was published by Salmon Poetry in 2016. This followed home more or less (Salmon, 2012) and his debut chapbook It’s Not all Bad (Heaventree Press, 2009). His poems have been translated into Romanian, Chinese, Italian, French and German and most recently into Galician by poet/translator Daniel Salgado and published as a chapbook, Poemas (Malinche Press, June 2017). 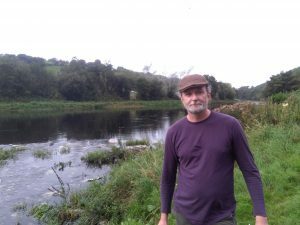 He edits the annual Unfinished Book of Poetry (transition year writing) and is the founder/director of the Ó Bhéal poetry readings and events programme in Cork, at www.obheal.ie. First Broadcast on Monday 30th October at 18.00 on RTE Radio 1 Extra. Sarah performs ‘No Thank You I Wouldn’t Like To Talk About It’. It is inspired by eerie sounds of wilderness that make one feel small and isolated such as the wind whistling through a gate. The poem describes how lonely and desolate places can provide comfort in times of need. First Broadcast on Monday 6th November at 18.00 on RTE Radio 1 Extra. John performs two poems written for the series – ‘The Inter’, a tribute to The International Bar in Dublin, where he started performing poetry and ‘Nursery Rhymes’ – a homage to the soothing words and melodies heard in childhood. He discusses how he started out making people chuckle with his poems, making up his own language and his processes for writing and performing. First Broadcast on Monday 13th November at 18.00 on RTE Radio 1 Extra.